The freedom to send and receive faxes anytime, anywhere from any device. Close a real estate deal on the spot or sign a purchase order from the airport with ease. Software-based fax frees you from outdated hardware and the complications of faxing over dedicated phone lines. Manage your incoming and outgoing faxes online and benefit from considerable savings. Then notifications and enter the email address you wish the fax notifications to go to. Then, click Advanced Notification Options and make sure the boxes 'Notify me' 'By email' 'Include attachment with email' are selected. Sometimes you need to send a fax as confirmation or when you receive a specific email, it is easy with a digital fax because you just need to send your fax (pdf) as email attachment, in the field "To:", type the fax number, followed by @rcfax.com. 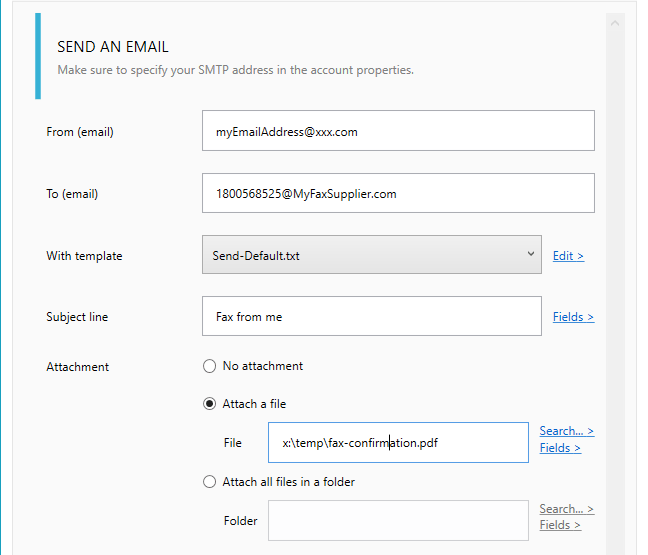 Note: When registering to RingCentral email-to-fax service, you can define which email addresses will be allowed to send fax, make sure to use the same in the field 'FROM'. - In the ‘To:’ field of your email simply enter the correctly formatted fax number followed by the extension ‘@rcfax.com’.